Waiting on Wednesday is a weekly meme, hosted by Jill at Breaking the Spine, that spotlights upcoming releases we can't wait to read! 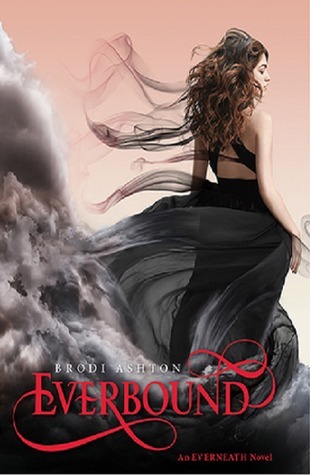 My pick is Everbound by Brodi Ashton! AHHH, I need Everbound so bad! I read the first book in this series, Everneath, in one day and it ended with a huge cliffhanger. *sigh* Only three more months...Everbound will release on January 22, 2013. The only thing I don't like when I read the synopsis for Everbound is that it looks like Cole will have a really big role in the story. He's a very complex and interesting character, but I like Jack so much better! I seriously hope that Nikki doesn't fall in love with Cole. I'm going to die if that happens, okay? Nikki and Jack need to be together! And yes, I love Everbound's cover. When it was first revealed, I was slightly disappointed and didn't think it was as good as Everneath's cover. But it's grown on me and now I think it might even be better than Everneath! I mean, look at it! I want that model's hair and her dress. And all the swirly colors in the cover...it's sooo pretty. Nice pick! I really enjoyed Everneath, so I'm interested to see what happens to Nikki now that she's destined for the Tunnels! Have you seen the novella that's coming out (Neverfall) written from Cole's perspective? It's got an awesome cover too! My WoW this week is Nobody by Jennifer Lynn Barnes! Oh yeah, I'm so excited about Neverfall! I love the silhouette cover...such a cool idea!! Great WoW! I love Jennifer Lynn Barnes! Thanks! :D I love Jack too, he's one of my favorite fictional guys. I was so mad at the ending of Everneath! Oh, you have to read it soon! :) It's so good! I am so psyched for this one too! Loved Everneath. I know right? :D January is way too far away! Awesome pick! I really enjoyed Everneath when I read it so I'm definitely looking forward to Everbound coming out!!! Me too! :) I can't wait! Yes, you do need to! :D Such a great book! Great WoW, looks so cool!